Gulf Craft, one of my favourite UAE manufacturers of luxury yachts and fiberglass boats recently exhibited in Thailand and found that Thailand’s natural affinity to life on the water is largely responsible for turning the country into one of the most desirable marine hubs in Asia. 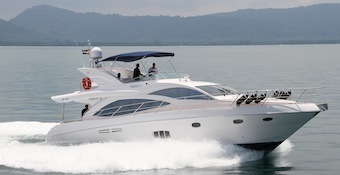 Having a close connection to Thailand I naturally agree with Gulf Craft on this one – absolutely loved the place and even got married in Hatyai before hanging out in Krabi for weeks enjoying the sun, sand and sea while shopping in Bangkok is just amazing. Thailand welcomed boating enthusiasts from across Asia and beyond to the Phuket International Boat Show (PIMEX) 2014. “Thailand offers a winning combination of beautiful beaches and water and a regulatory environment and infrastructure that allow cruising to be easy and pleasurable for yacht and boat owners,” says Erwin Bamps, Chief Operating Officer of Gulf Craft. “It’s a winning and enviable formula that any country keen to capitalize on its marine assets would be lucky to possess and one that Thailand has very successfully translated into tourism dollars. Thailand is country where we see yachting and tourism grow hand in hand, and a compelling reason for that growth is the country’s intuitive boating culture,” Bamps continued. “Both, resident boat owners and boating and yachting tourists visiting Thailand find it very easy to head out and enjoy the water,” Bamps continued. According to information released for the Tourism Authority of Thailand (TAT) in October 2013, yacht brokers predict that the number of yachts visiting Thailand will increase significantly by at least 31.25%, to approximately 2,100 yachts, by 2016. According to the TAT figures, Thailand currently welcomes 110 superyachts each year, identified to be among the highest tourism spenders. TAT predicts that by 2016, Thailand will welcome 190 superyachts annually, accounting for a growth of 72.72%, and generating significant income for Thailand’s marine industry. Gulf Craft says the market looks incredibly promising and is showcasing a range of its yacht and boat models including the Majesty 56, Silvercraft 34, Silvercraft 36 HT and the Silvercraft 36 CC, the latter making its regional debut at PIMEX. Gulf Craft’s foray into South East Asian markets extends back to 1992. Sales of Gulf Craft’s range of Oryx sport cruisers, Silvercraft fishing and family boats have since grown strongly. The company has also witnessed growing interest in its premium yacht brand Majesty Yachts in recent years with its Majesty 88 and Majesty 56 models drawing particular attention.